Lisa Yuskavage’s debut show with Zwirner Gallery in London. RIP: Khadija Saye, who passed away at the age of 24. When she was among the missing after London tower blaze. David Lammy speaks about her and the fire, calling it “corporate manslaughter”. MAMA Gallery closes its space in LA. NY Times looks back on the life of the late Benjamin Cho. On Stellar Rays gallery to close and reopen as Stellar Projects. Dover residents campaigning against the demolition of a building on which Banksy painted his Brexit mural. Leonardo DiCaprio surrenders Picasso and Basquiat works to US government as part of 1MDB investigation. Jenny Dixon announces retirement as director of Noguchi Museum director. Partial blockade of Qatar by Middle East countries likely to destabilize cultural institutions and partnerships. Louvre Museum evacuated again after security threat. Mill of Blood by Antonio Vega Macotela at documenta 14 damaged and being repaired. Animal rights activists attack Aboubakar Fofana’s studio because he used sheeps in his documenta 14 work. Marc Spiegler defends Art Basel from charges of colonialism. Painting discovered in an Arizona garage possibly by Jackson Pollock and could fetch $15mil. The Getty agrees to voluntarily return 1st-century BC sculpture to Italy. The Getty gets £24.5mil. Parmigianino after no UK museum tries to match price and export bar lifted. The Broad will host major Jasper Johns show in 2018. Met president Daniel Weiss takes over as chief executive, as museum searches for new director. Wolfgang Tillmans, Delya Allakhverdova, and Maria Sukkar elected to the ICA council. Forbes writes about Frank Lloyd Wright’s MoMA retrospective. Rare images of daily life in North Korea to go on show at the American University Museum in DC. The history and future of Fondation Beyeler. Fondation Beyeler’s show during Art Basel 2018 to feature Giacometti and Bacon. Artnet reviews the Wolfgang Tillmans show there. Raphael’s drawings at The Ashmolean Museum at the University of Oxford. Fahrelnissa Zeid exhibition opens at Tate Modern. Daniel Traub documents African residents of Guangzhou for show at the Shanghai Centre of Photography. The Art Newspaper interviews Wim Delvoye on occasion of his retrospective at the Museum Tinguely. A look at the Tony Smith show at LACMA. LACMA adds Allison Berg, Troy Carter, and Carter Reum as board members. The Art Newspaper’s list of essential works and installations at Sculpture Projects Münster. Artnet also picks some highlights. The Power Station in Dallas has new artist exchange residency program called PROXIMIDAD. Ai Weiwei plants iron tree sculptures at the Israel Museum. The Museum of Capitalism (MOC) opens and explores capitalist economic systems. First-ever Kuala Lumpur Biennale (KLB) International Arts Exhibition to launch in November. Acute Art virtual reality platform launches with works by Jeff Koons, Marina Abramovic, and more. Sotheby’s to auction Dora Maar ring create by Picasso. Sotheby’s is also auctioning Andy Warhol’s first self-portrait. Agnes Gund sells Lichtenstein’s Masterpiece to Steve Cohen to start criminal justice fund. Artnet interviews Ford Foundation president Darren Walker about the fund. Exploring art fair economics for smaller versus larger galleries. Artinfo has a sales report from Art Basel’s VIP opening. Judd Tully also provides coverage. Alexander Forbes reports from the fair. The Art Newspaper also provides coverage on sales. Artnews lists some sales. Artinfo’s sales report from day 2. Works from the ’80s sell well at the fair. Rob Pruitt’s art world lookalikes at Art Basel Unlimited. Artnet’s highlights from Unlimited. Artists exploring LGBT causes at Art Basel. The Basquiat works for sale at the fair. Artnet’s choices for The 10 Best Artworks at Art Basel 2017. Mechanical works were popular at Art Basel. Art from the fair that deserves a closer look. Artnet’s list of 5 Rising Stars to Discover at the Liste Art Fair 2017. Artinfo interviews Sven Eisenhut about Photo Basel. Ten highlights from Design Miami/ Basel. Rodman Primack also makes some picks from the fair. Where all the artwork goes after a fair. A look at the art storage industry. The effect of documenta 14 on the market for artist’s works. Upstairs Art Fair coming to the Hamptons, NY. The Art Newspaper explores the market for Gutai works. A look at the rise of the market for Alberto Giacometti‘s works. Andrew Goldstein interviews Brett Gorvy about his new market strategy. Katya Kazakina writes about bankers attending being in town during Art Basel. The must-see shows in Basel this week. Artnet also compiles a list. Galerie Thaddaeus Ropac to represent the estate of James Rosenquist. Lisson Gallery and The Vinyl Factory team up for multi-disciplinary art show at The Store Studios. Bill Viola made an honorary member of the Royal Academy of Arts, London. LA Times interviews Sam Durant about taking down his work. Artnet interviews Lucy Sparrow about her felt bodega installation. Artinfo interviews Joel Shapiro about his show at Pace London. Jan Kiefer speaks with Blake Rayne. Frances Bean Cobain has her second show, at Gallery 30 South. 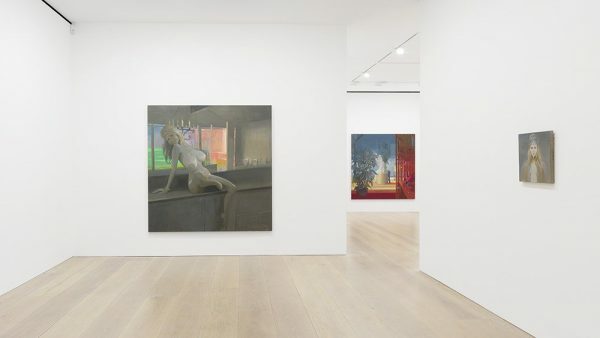 Artinfo looks at Eric Fischl’s show at Skarstedt, New York. Kevin Beasley in conversation with Kellie Jones. David Pagel reviews Bernadette Corporation’s The Gay Signs at House of Gaga/Reena Saplings Fine Art. Eleven winners of 2017 Swiss Art Awards announced. Catherine Wagley reviews The Dream Colony, a book about Walter Hopps. Lushsux paints awkard hug denial by Jerry Seinfeld towards Kesha. Scarlett Johansson narrates MOCA video on Jeff Koons’s career. Paramount’s Old Master Transformers painting marketing prank. The rise of Avocado Art. Justin Bieber did not attend the Art Basel fair. Categories: Art, Contemporary Art, Low Brow & Pop Surrealism, Overtime, Street & Urban Art. Tags: Contemporary Art, Features, Lisa Yuskavage, Low Brow & Pop Surrealism, Overtime, Street & Urban Art.